Common wisdom says that if you’re child drinks milk and plays outside, he’s getting enough vitamin D, right? Surprisingly, not necessarily. ​We know more about vitamin D than we did even five years ago. Because of lifestyle changes and sunscreen usage, the majority of the population shows signs of vitamin D deficiency. Vitamin D helps ensure the body absorbs and retains calcium and phosphorus, both critical for building bone. A vitamin D deficiency can lead to rickets, a bone-softening disease that continues to be reported in the United States mostly in children in the first two years of life. Vitamin D deficiency also increases the risk of bone fractures in older children, teens, and adults. 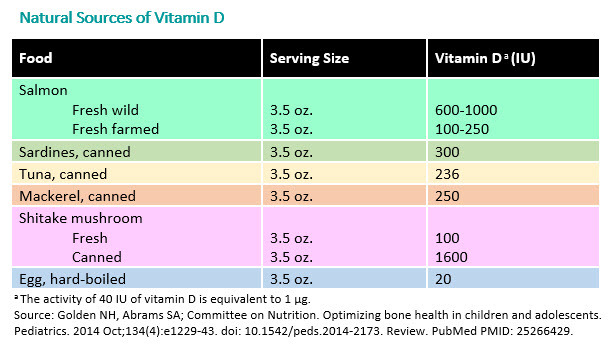 Vitamin D is measured in International Units (IU). The increase in the recommended amount of vitamin D children need each day is a result of new evidence showing its life-long health benefits. Supplementation is important, because most children will not get enough vitamin D through diet alone. For a list of foods with vitamin D, click here. See the products for supplementing Vitamin D below – along with the links posted. 1. Breastfed infants and partially breastfed infants should be supplemented with 400 IU/day of Vitamin D until your infant is weaned to at least 18-20 ounces of vitamin fortified formula. Supplement with 400 IU when switching to milk at 12 months of age. When switching to milk, we no longer recommend switching to whole milk. All children should be on nonfat milk at age 2, and most should be on nonfat milk starting at age 1 when they switch. The amount of Vitamin D is the same in all types of milk. Higher fat does not confer advantages, in fact there are disadvantages. 2. Older children (older than 12 months of age should receive 400-600 IU per day of vitamin D.
3. Adolescents who do not obtain 600 IU of vitamin D per day through diet and vitamin D fortified foods (such as cereal and eggs) should receive a vitamin D supplement of 600 IU per day. Just D – Sunlight Vitamins Inc. Contains 50 doses. Contains only vitamin D with no additives. What are the current recommendations for calcium? Dark green, leafy vegetables such as kale and turnip greens are low in calories and high in calcium. However, spinach is not a good source of calcium. Calcium-fortified juices and cereals can help boost the calcium in your diet, but limit yourself to 8 to 12 ounces (1½ cups) of juice a day. Certain medicines and diseases—Some medicines and kidney and intestinal diseases can cause you to lose calcium from your bones. Ask your pediatrician if any of the medicine you are taking affects your bones and what you can do to protect them. Choose milk or smoothies instead of soda at restaurants or school cafeterias. Create special drinks with milk. Add flavorings. Make shakes or smoothies. Use low-fat yogurt on its own or with fresh fruit. Add it to pancakes or waffles, shakes, salad dressings, dips, and sauces. When possible, choose sources of calcium that are either low in fat or have no fat at all. If you make the right choices, the foods you eat or the things you drink can provide the calcium you need.